The southern coast of Western Australia around the regional town of Esperance is thrilling terrain, writes Terry Chellappah, who wonders why it took him so long to experience it first hand. Being resident in the wonderful Margaret River region of Western Australia for a decade now, it had become easy to grow blinkers and regard this beautiful area as the pinnacle of the pristine and exciting Western Australian landscape. Many of you know and love the wine and food culture in Margaret River; add to that the rugged coastline, with a dash of art and craft and of course the world renowned surf beaches and you have an enticing and accessible travel cocktail. For some time now, our family has been keen to explore the more remote areas of Western Australia that are only accessible by 4 wheel drive vehicles. The recent purchase of a Land Rover Discovery 4 was the catalyst to get more motivated and adventurous and we have discovered some lovely spots around the Margaret River region in the last few months. We had also heard so much about camping in the Esperance region, and with our new chariot waiting, the eight hour drive now seemed a mere spin around the block. So, on New Year’s Day 2011, my wife Amanda and I set off for the southern coast with our son Jasper, and Amanda’s father Pete who was visiting from Melbourne. Our sixteen year old daughter Amara had ‘thrown a wobbly’ as we say, and announced in no uncertain terms that multiple hours in a car and a week of remote camping under the stars (sans mobile phone coverage, internet and retail therapy at her fingertips) was not for her in any way shape or form. So, there was more room in the car for the rest of us! Our friends and neighbours Britta & Dennis, their friends Ash & Mark along with more friends of theirs (who were bringing a little runabout boat) also came along so we had a convoy of three or four vehicles, which is always reassuring when heading down a remote sandy track. 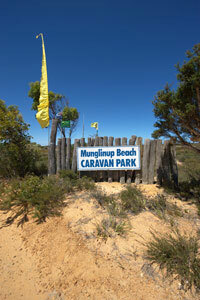 Our destination for the first 4 nights was an Eco Campsite about 100 kms west of Esperance at Munglinup Beach www.munglinupbeach.com.au. The 700 km drive from Margaret River was really pleasant, winding our way through the pretty towns of Nannup, Bridgetown and Boyup Brook, before the road opened up to the southern wheat belt and wide open plains. The roads are excellent and we made good time with only a fuel stop needed before we hit the little town of Ravensthorpe. After 6 hours behind the wheel, I was thirsty and hungry – the Ravensthorpe Hotel looked like an oasis for a late lunch. We were just in time to order before the kitchen closed. A decent steak sandwich (with onions and mushrooms!) washed down by a cold Carlsberg really hit the spot and we were off again on the last hour of our trip. We had been recommended the Munglinup camp as a remote and relaxing base for beach adventures, but were warned that it was ‘not much to look at’! We arrived mid afternoon, to find a well organized and set up campsite – much bigger than we had envisaged. We were pleasantly surprised. The neighbours were there to meet us (they had a left a few days earlier) and after unpacking and setting up, we made the 5 minute dash to the beach to inspect conditions. Swimming, snorkeling, fishing and abalone harvesting (a license is required for abalone and I did have one) were all high on the agenda. Prioritizing was going to be difficult. Although very windy that first afternoon, the local beach was stunning and crowded, but we were told that there were a number of pristine and desolate beaches to check out along a 4 wheel drive track closer to the campsite. That was for tomorrow, for now it was beer o’clock! Back to the campsite and over a few icy brews, we plotted the first major task at hand. Dinner! One of the wonderful things about camping with friends of like mind is the way resources are pooled in a modest environment with basic facilities to create something memorable. We had brought along a frozen curry to warm up for the first night (nice and easy), and the neighbours had also brought produce to make a curry so this was to be a curry night! We took the camp kitchen over and the long wooden table there was to become our al fresco dining room for the next 4 nights. Encouraged by several good bottles of Margaret River wine, the night was great fun and spirited. Somehow, we managed to relieve several bottles of their contents with alarming velocity. We slept well and woke to a sunny but windy day 2. The plan had been to head off on a reconnaissance of the more remote beaches to discover fishing spots, but the southerly wind was too ferocious. So we implemented Plan B – the Oldfield River runs alongside the campsite and it was well sheltered from the prevailing winds. We packed a picnic lunch and 10 minutes drive along a sandy track led us to a very calm and protected little cove. We did nothing more that day than fish, swim and tell tales, some of them true. After a small scare when some of our party disappeared for a couple of hours (in remote locations, it is essential to let everyone in your party know where you will be at all times as it easy to get lost, stuck or break down), the dinner committee once again convened to weigh up the merits of BBQ Margaret River Porterhouse steak and homemade coleslaw vs those yummy spicy lamb Merguez sausages that our friend David Hohnen (who founded Cloudy Bay & Cape Mentelle) makes at his farm in Margaret River. There was much toing and froing, mainly to the esky for icy beverages but Porterhouse it was! We were confronted yet again with the aberration that all our wine bottles were only partially full on opening, but we were coming to accept that! We rose on day 3 to another windy and for the first time rather overcast day. The neighbours decided to take the opportunity of unfavourable conditions to make the 1 hour drive to Esperance to check it out. I think they needed real coffee, badly! We decided to stay put and check out the beach tracks. Serious hunting and gathering was called for. We set off and for the first time were made aware of Amanda’s unknown phobia – off roading! My wife has a history of adventurous behaviour in her youth – she rode a motorbike, skied and was a diver, but this new challenge of sitting in a large vehicle while it is careering, sliding and lurching, to her mind uncontrollably down a sandy track without knowing exactly what is coming the other way was too much to bear. She would insist on getting out and walking through the particularly hairy sections! I now refer to her condition as ‘trackaphobia’; and it looks like it is here to stay! We investigated Whale Beach and Darkies Beach before deciding on spending some time at Christies Beach. This is where a whale had beached itself some weeks earlier and if you misjudged the wind and positioned yourself down breeze, the stench was epic. After some exploration, I got into the water amongst some rocks with abalone on the radar. I didn’t have to look far. After spending 3 hours snorkeling back home at Margaret River to get my bag limit of abalone some weeks earlier, here in this pristine bay I managed to fill my legal bag with good size abalone within 20 minutes. The marine life there was spectacular and the waters as clear as glass. We saw octopus and stingrays gliding amongst the rockpools, all the while maintaining our position up breeze from the whale remains. With our bag of abalone secured, we decided to wet a line off the beach. The stunning water was cool, but pleasant to stand knee deep in as we cast our lines up and over the gentle swell rolling in and Jasper managed to hook a few nice sized Skipjack, just enough for his dinner. We cleaned and filleted our catch and Pete shucked the abalone, a task that proved to be more challenging than just a passing flick of the knife. Mission accomplished, it was back into the car and despite some squeals and shrieks from Amanda (who now insisted on sitting in the back seat! ), negotiated our way back to the camp for a shower and cleansing ale or three. Those spicy lamb Merguez sausages on the Weber with home made potato salad were just the ticket, and Jasper devoured his fish simply pan-fried with a squeeze of lemon. The neighbours returned from their day trip to Esperance, with tales of beaches even more stunning than the ones around Munglinup. Could this actually be? Surely not! We sat late into the night, and over several more bottles of Margaret River’s finest plotted tomorrow’s assault on a beach further down the track we had explored earlier that day. Hard, dusty work but the view made up for it! Day 4 was not as windy as the previous few days, and we hit the track after the neighbours showed us the Canadian protocol of eating pancakes and scrambled eggs; smothered in Canadian maple syrup! Did someone say this was roughing it?! With our convoy of three vehicles, we churned our way past the beaches we checked out the previous day and onto Skippy Rock – a massive boulder jutting out into the ocean like a natural jetty. This is where we hit our first and only real snag off road. As we came up onto a sharp rise that looked down to the beach, I felt our front left tyre pinch against a limestone rock followed by a loud ‘pop’. 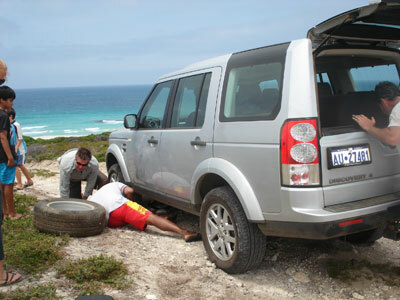 We didn’t think too much of it initially, but when Amanda insisted on jumping out before we drove down the steep track to the beach; her shrieks raised the alarm – I had put a massive gash in the sidewall of the tyre and it was as flat as one of Dennis’ pancakes! So, it was all hands on deck to unload the car, read the various manuals (undergraduate engineering degree required), locate the jack, work out how to access the spare and change the wheel. Many hands made light work and before we knew it, we were down on the beach unloading our gear. Skippy Rock was amazing. We caught some small fish off the rock, nothing to get too excited about until we did some exploring. 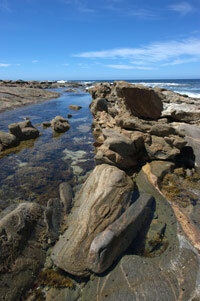 Around the corner we found more stunning rockpools and the abalone knife came out once again. Before I knew it, I’d reached my bag limit and our attention tuned back to fishing when Dennis landed a nice sized Black Cod. We had a fantastic time investigating those rock pools and returned to the rock to find that Mark had found a productive herring hole, and had been pulling them in. 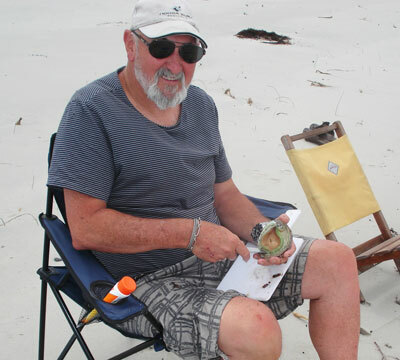 By the time we cleaned and filleted the fish, and Pete had shucked the abalone, the weather had turned and it was time to pack up, have a quick beer on the beach and head back to camp. This had been the best day of our trip – so far – and after a quick shower, it was once again beer o’clock and plans for dinner were laid. The idea was to start with a shared entrée of abalone – prepared very simply. The abalone was sliced as thinly as possible (we did of course bring a decent cook’s knife, non stick wok not to mention Riedel stemware! ), heat extra virgin olive oil in the wok, throw small batches of abalone in and flash fry with a quick splash of light organic soy. A mere 10 seconds in the wok and the delicious slippery morsels were ready to be devoured. Whilst I worked to a strict time controlled regime at the wok, our crew washed the abalone down with refreshing, citric Margaret River Sauvignon Blanc Semillon – surely the perfect summer match for abalone. The Tanker Jetty – an imposing sight! Entrée was followed by a final night feast – there was an array of fresh fish, followed by the remaining BBQ Porterhouse steak. Ash had even managed to keep a bottle of French bubbly under wraps; saving it for the last night camping and that was demolished post haste! This was to be the last night we were all together so a celebration was called for. We awoke on day 4 to a hot and still day. It was certainly a lot warmer, and the prediction was for a change and thunderstorms later that day. Britta & Dennis (feeling the effects of the previous night’s feasting) were heading back home to Margaret River, while Ash & Mark were moving east, about 80 kilometers past Esperance to camp at the Duke of Orleans Bay (http://members.westnet.com.au/condingupwa/orleansbaypark.html). We had organized to rejoin civilization and booked accommodation in Esperance (http://www.visitesperance.com/pages/about-esperance/) for the next three nights at The Jetty Resort (www.thejettyresport.com.au). We arranged to catch up with Ash & Mark at their campsite in two days, so we all packed up, said our farewells and headed off on our way. Sammy – doing what he does best! The short drive to Esperance was pleasant and cool in the car, but keeping one eye on the ambient temperature reminded us of how hot it was outside. The temperature climbed steadily up to 40 degrees before we hit Esperance, and when we arrived at the hotel and I went to check in, it was dry and very hot with not a breath of breeze. There was still no sign of the thunderstorms predicted, but a phone call to a friend back home (yes we were in mobile range after 4 days of isolation – we weren’t sure that a good thing) confirmed that it was pouring in Margaret River as did a text from Britta who said it was also teeming in Albany, about 500 kilometers west of us. But for us, it was a stroll across the road to the beach and a walk out along on the famous ‘Tanker Jetty’ (http://www.visitesperance.com/pages/tanker-jetty/) in Esperance. This landmark is almost 1 kilometre long and is a haven for tourists and fishing, not to mention the home of ‘Sammy’ the resident male sea lion and his harem! The very comfortable apartment at The Jetty was a treat after our modest accommodation of the previous four days. With the relative luxury however came the trappings of home – mobile phone coverage, the internet (and naturally email, read WORK) and of course the dreaded television. Being somewhat of a cricket tragic, it had only occurred to me at the start of day three of the fifth Ashes Test that I was totally out of the loop. What was the score, who batted first, was it over already? So, some quality time catching up with the score was in order before a drive along the Great Ocean Drive, heading west along the coast. This is a must for anyone who appreciates stunning views and glorious beaches. As the temperature had now topped 43 degrees, a swim stop was essential so we hurled ourselves into the crystal clear waters at West Beach for a well earned dunk. It was hot, clear and still. 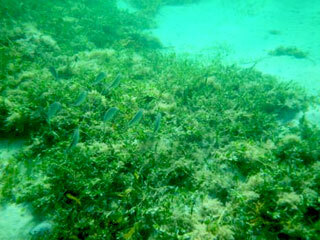 The underwater visibility seemed to go on forever and the water was invigorating; it was picture perfect. Even walking along the beach was special, with the sand so finely grained as the tannins in great Cabernet Sauvignon that it squeaked between your toes. 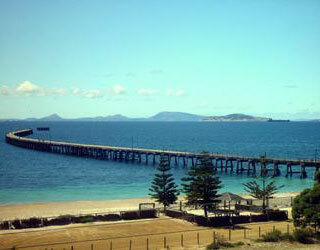 From West Beach, it was back to the Jetty Resort just before a bizarre sand storm hit Esperance. Standing on the balcony looking west, I saw dark brown cloud approaching on the horizon. It arrived with some velocity, and the tempest was short and sharp. There were gale force winds whipping up all manner of sand and debris and it lasted for about ten minutes; only to be followed by steady rain that looked to be the tail end of the storm that had come from the west. The temperature dropped 20 degrees in the space of half an hour – quite amazing! It is not often our family goes on holiday without dining out. In fact, we couldn’t recollect such an occurrence. Eating is important, and we are good at it. Whilst we love buying good produce and cooking it, we also love restaurants. We had done some research on the best places to eat in Esperance, and had drawn a big blank. Some of the better run cafés looked to be cashing in on the tourist season by offering set or degustation menus – not an option for us in our relaxed beach mode. Good food was essential, but lots of formal courses not on the agenda. As a family, we love good Chinese food (without being regionally specific), and in this remote outpost we were spoilt for choice – there were two Chinese restaurants! Flicking through menus for both in our apartment, we were sold by The Emperor’s Garden, which proclaimed it to be the ‘most recommended’ in town! It was worth a shot. We drove through the gentle rain to the restaurant a few blocks away. The façade and dining room were classically predictable, but in a kind of homely, reassuring way. Whilst we had to wait some time for our food (it was about half full – probably as busy as they get! ), the food when it arrived was fair to good, with the spicy Szechuan dishes the highlight. It was pleasant and ridiculously affordable, washed down with some chilly beers and minerally Margaret River Chardonnay. A comfy bed was calling out to us, so an early night was in order. Frenchman’s Peak – tempting but too much for us! Day 5 kicked off early, and we came to realize that although we were on Western Standard Time, we were so far east and close to the South Australian border where they had daylight saving over summer (moving the clocks ahead by an hour to maximize sunlight hours later in the day) that by 4:30 AM the sun was rising rapidly. The sky was blue, and the storm had passed without too much influence on Esperance. We had been very lucky with the weather so far. The plan today was to hit The Cape Le Grand National Park. 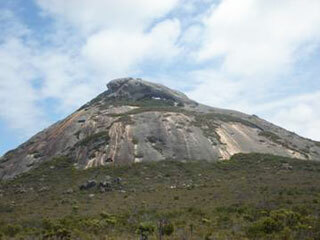 This was the first of two large national parks east of Esperance, the other being the Cape Arid National Park. Cape Le Grand was a short 50 kilometre drive from Esperance, so after booking our car in to have the spare tyre replaced (we had to order one in from Perth), we set off after breakfast with some snacks and were soon driving through the park amazed by the stunning scenery and unspoilt landscape. 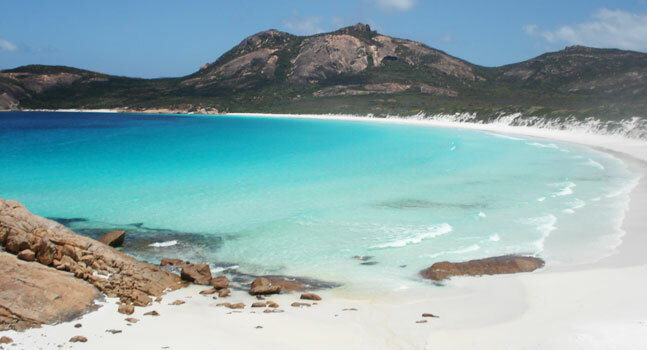 The Esperance coast has had a long history of maritime exploration by the Europeans, dating back initially to the Dutch in 1627 and thereafter by the French and the English. The sparkling bays in the park are all spectacular as is Frenchman’s Peak, a massive, towering rock the demands to be climbed. We were told to allow a hour and half for the round trip but that was too much to expect of us in our relaxed, cruisy mode. Instead, we checked out the bays with their mesmerizing bluey green waters and silky white sand. Twilight Cove, Hellfire Bay, Lucky Bay and Le Grand Beach were all worth dropping in to see. There was a caravan and camping site at Lucky Bay, where we could drive right down onto the beach and along the white sandy shore for as far as the eye could see. These were the sites we had heard so much about and now we knew exactly why. Around every turn there was a postcard view and we were told that in Spring the wildflowers were amazing. 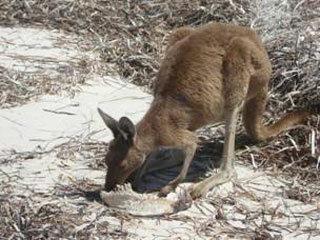 Yes – a kangaroo eating fish at the beach! 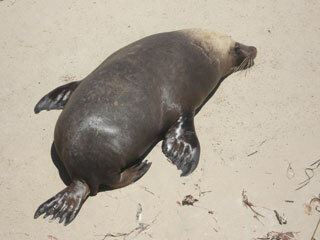 It was at Lucky bay that we saw one of the most amazing sights we had ever seen. As Pete, Jasper & I wet a line (with no luck on this occasion), Amanda foraged around the beach and came across a local cleaning up the tasty morsels left on a recently filleted fish frame. We had always believed kangaroos were herbivores, eating only plant matter, but here they were quite happy to be eating fresh fish. What else would you eat in at the beach?! No food miles to be calculated here! This was a truly amazing experience and one we will never forget. It alone was worth the drive! With no fish in our bag but our senses satisfied, we headed back to Esperance ready for a hearty dinner. Our apartment had a respectable kitchen and a good BBQ set up around the pool so we called into the local butcher shop and picked up some nicely marbled local Scotch Fillet steaks as we decided to eat in. The truth was that there were no options that interested us at all in town, and we were sure we would eat better at our apartment. 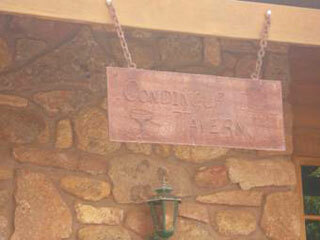 The rustic sign outside the Condingup Tavern! We had a swim in the pool, fired up the BBQ and knocked back a few cold brews as we put together a salad and roasted some new potatoes. We also snuck in a small entrée of abalone – that was remaining from our Munglinup harvest. Prepared the same way, it was just the ticket to get our appetite worked up for main course. The steaks were delicious with a couple of bottles of Margaret River Cabernet Sauvignon just for good measure. The next day was to be full of fishing and adventuring as we drove east again to meet up with Ash & Mark at The Duke of Orleans, so sustenance was required! After rising early once more on day 6, I zipped off to the tyre shop to get our spare tyre replaced. We were likely to go off road again today, and that is something you do not do without a spare tyre on board! We hit the road mid morning and headed for Condingup where we had arranged to meet Ash & Mark and their friends for lunch at The Condingup Tavern. We had heard much about the food at this remote tavern from locals all week, so this seemed a good opportunity. 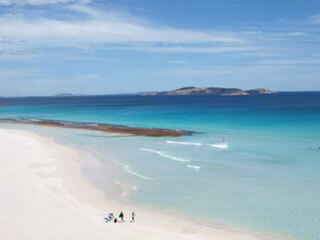 Condingup is the gateway to the Duke of Orleans Bay and is only a short 85 kilometre drive from Esperance. We arrived in good time, and found a little tavern with fuel station and general store attached. This was a one horse town! We had a cleansing ale at the bar and when the others arrived, secured a large table in the beer garden and ordered beef burgers and fish burgers all round. The beers were cold, the service relaxed and friendly and above all the food very hearty. All in all, well worth the trip. All we needed were some chips! Well fed and watered, we headed down to nearby Wharton Beach for a spot of beach cricket. That was high on Jasper’s agenda and one box we had yet to tick, so it had to be done! The beach was wide and as white as snow, and once again we could drive right down to the water’s edge to set up the stumps on the firm wet sand. Some lofty shots were played, catches dropped and tumbles taken before it was time to head to the bay as the others were about to launch their little boat for a spot of fishing. Our luck had turned and no sooner had we weighed anchor, and we were pulling in herring and skipjack. Some were a reasonable size and Jasper’s ‘skippy’ in particular was a good fighter. I even managed to land a snook, a long nosed piscatorial creature that did put up quite a fight. The boys had a great time bobbing around in the boat at this beautiful bay. By the time we had cleaned the boat down, attended to the fish and enjoyed a few relaxing brews whilst exaggerating to anyone who would listen about the size of the fish we caught, it was almost eight o’clock in the evening and the sun was dropping in the west. Time to hit the road, and we were thankful that it was only a short drive back to our apartment. 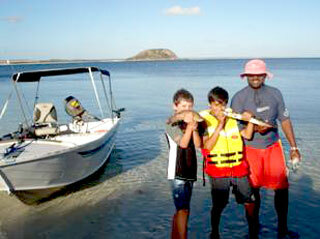 We had decided to leave our bounty of fish with the campers as we had notions of dinner in Esperance. We were however very tired by now, and our last meal in Esperance was not going to be a culinary adventure by any means. After well earned showers, we decided to stay in and raided the remains of our camping rations. There wasn’t much left; some abalone in the freezer – that was for another day back at home, some leftover steak and a few packets of the old faithful 2 minute noodles! A beef and noodle stirfry it was to be, spiced up with some sambal I had tucked into the esky for this very purpose! It hit the spot, shortly before we hit the sack. It had been a big week. We rose on our day 7, sad that our little adventure was coming to a close, but looking forward to an overnight stopover in Denmark, a little town near Albany to stay with Rose & Paul, friends we hadn’t seen for a while. The 5 hour drive to Denmark was enough to revive our hunger and thirst and a welcoming gin and tonic was just the ticket after a week of beer! We feasted again that evening on a BBQ of Amelia Park lamb cutlets and local Esperance reef fish we had picked up before leaving, and fell asleep well satisfied with the world. A fish eye view of Greens Pool! The drive home was uneventful and gave us plenty of time to reflect on all the wonderful times we had and stunning scenery we had seen over the week. This is a trip we will not forget for some time, and one we will definitely repeat again. In fact, the neighbours are coming over for dinner tonight, and we may well plot another adventure! Until then……..